As experienced floor buffers, we use professional equipment; we also use the best cleaning and waxing products on the market. 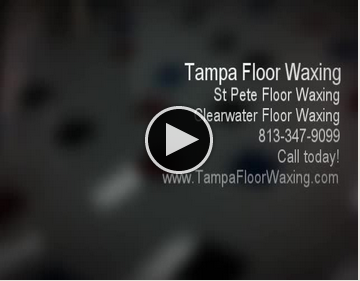 Come find out why we're the most affordable floor waxing service in the greater Tampa Area. Tampa Floor Waxing can help you keep those high traffic areas looking beautiful while extending the life of your floor. Dirt and grit can damage your floors permanently and cause unsightly and unsafe scratches and nicks; let us strengthen your floors. 1000 TO OVER 100,000 SQUARE FEET! $2 MILLION GENERAL LIABILITY INSURANCE! Ready for a no nonsense floor cleaning experience? Call me today! In the Tampa Metro area for over 18 years, we are a family owned and operated PROFESSIONAL floor care company that caters to YOUR needs! No hourly employees...the owner is on EVERY JOB! Call me today, and ask me for some references from others who have "experienced the difference!" Tampa Florida Floor Waxing -- Call for a free estimate today! We'll save you money! We've been serving the Tampa area for over 18 years. We are a real local business, and not an answering message center. Call Us Today at: 813-347-9099 Request a Quote Today!